Cole vowed to find Wu, right? He found the baby. And the baby only drinks tea. That’s pretty subtle, but it has to be Wu. On a different note, can they not just create dragons now? That would have been pretty useful when Lloyd and Harumi were falling from the sky. I guess he was panicking too much and couldn’t? Regardless, amazing episode. Me and you both, I was thinking about the dragons-thing for like half the episode. It's rather interesting that they removed/moved away from something that practically only non-movie fans would know, while going back to Zane's and Pixel's relationship, the non-movie fan aspect. It makes the idea that the writers are confused. 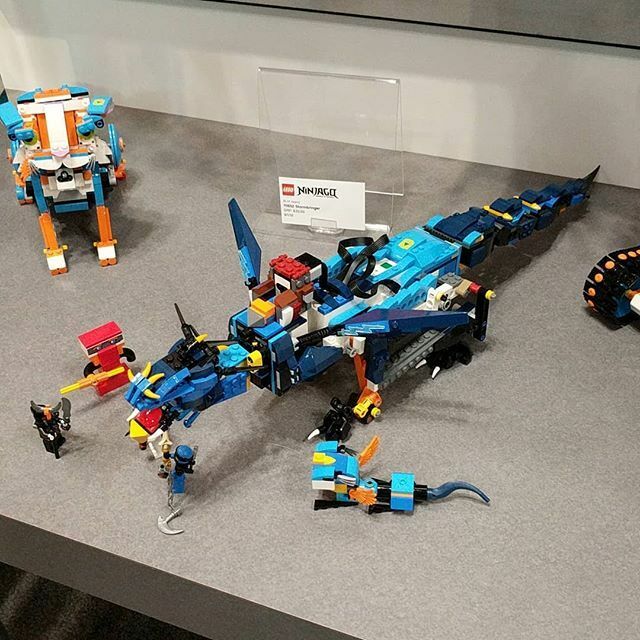 They used Jay Dragon just to show-off that Lego Boost can adapt to this set... Well at least it's less of the Green Mech Dragon structure. Ooh, that hook that Jay has looks cool. As for the set I am glad to know that all the extra colors are added on... otherwise it would be one ugly set. Are those pieces only from Boost and Jay's Dragon, or are there additional pieces? Now that I've had some time to think about episode 79, it's not as incredible as I first implied. No doubt, it has some of the most dramatic scenes so far, but in terms of telling a story, I definitely feel there were pacing issues. There was also the issue, like many others mentioned, about how the Ninja could have easily summoned their dragons to overcome certain situations. A flawed episode, but a revolutionary one none the less. The Hageman brothers have previously stated how they have to either write out or straight up ignore the Ninja's powersets due to fear that they'll be overpowered and use their abilities as a 'get out of jail free card' for any situation. It's why they constantly take their powers away, and why the Tornado of Creation seemed to fall off the face of the Earth alongside NRG forms. It seems the dragons and Airjitzu went the same way. Personally I have no problem with them taking away Airjitzu and the elemental dragons. I just want to see them try to summon the dragons or do Airjitzu. The attempt is important, even if they fail. I know Tommy Andreasen somewhat explained it in Way of the Departed but addressing the issue in the actual show would have been very welcome. The ninja can try and then fail. With failure comes the challenge to adapt. To quote a recent trailer, “Now that’s just lazy writing.” That said, the fact that that’s really one of the only major plot holes so far this season is pretty comendable for Ninjago. If you really want to, you could say that the time travel stuff that changed their appearances also took away the dragon powers. But did the time travel actually change their appearances? We see pictures and flashbacks pointing to the idea that this is just a recent development. The time travel joke seems to be exactly that, a joke rather than a proper explanation. So, I pretty much found clips of all the spoilers for the latest episode and I have to admit that, shock-value wise, this season is going by a pretty low-curve. My below comments address the newest episode (80) and therefore I suggest reading them only after you're caught up with Ninjago's current season as to avoid spoilers. -Pixal malfunction happens in Hands of Time & Samurai-X appears right afterwards -> Pixal is revealed to be Samurai-X. -A weird baby that has appeared from out of nowhere is now respected/treasured as being important and likes to drink tea like a character that had just went missing -> It's sensei Wu. -Some suspicious activity has been going down in the royal family, meanwhile key information for the Ninja's anti-Sons of Garmadon operations is getting leaked while they take a member (Harumi) of said family to live with them -> The Quiet One was Harumi. -As for Mr. E's reveal, it's an interesting decision made by the writers that I believe will be explored more within the season, but, as it stands now, him being a Nindroid has contributed nothing to continuing the main plot of the season. To bring all of this together, I feel, in my personal opinion, that the show had attempted at making a series of mysteries for things that didn't necessarily need to have them/were blatantly obvious to begin with. I imagine the next one will tell us that Mr. E is Echo Zane. This episode confirms that the new appearances are not due to the time travel. You can see a picture of the Ninja in their old forms. I somewhat agree with you (mainly with Pixal and the baby), but I feel that there's a lot more to Harumi than we all think. What surprised me was the fact that the writers decided to make the reveal so early, only 6 episodes in out of 10. So... was that the first kiss in a Lego property? I guess there were the penguins in Lego Batman... Anyway, I thought the look on the Ninjas’ faces as they realized who the baby was was hilarious. Decent episode, although they could work on not telegraphing twists. Edit: Also, since Harumi is the leader of the SOG, and because of the way she talks about wanting to meet her parents, I think she may actually be Lloyd’s sister. If so, the Star Wars influence is strong with this one. Nah, Jay and Nya have been smooching for years. Oh yeah you’re right. Forgot about that. It's okay, most people try to. So... was that the first kiss in a Lego property? I think there was also one in Clutch Powers. I might be misremembering it though.